With a warm understanding of what it’s like to be young (and young at heart! 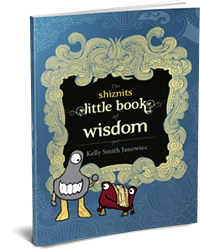 ), the Shiznits help guide toward self-awareness and independent thinking. This little book is a collection of thoughts and insights from each of these adorable little monsters as they converse with us about the things they’ve learned from life. Their courage and bravery to self reflect and make choices from a place of awareness is honorable and inspiring. Enjoy their candor as the Shiznits open their hearts to share their best advice! We all make mistakes. What’s important is that we do our best, correct our mistakes, and move forward without dwelling on what we did wrong. Oh yeah, and it helps to not make the same mistakes over and over. This cute little full-color paperback is 4-3/4″ x 6″— just the right size to fit in the back pocket of the full size shiznits.